Twenty-eight-year-old S.A.K. was detained on Thursday while visiting her husband, under arrest over alleged links to the Gülen group, which the government accuses of masterminding a July 15, 2016 coup attempt. 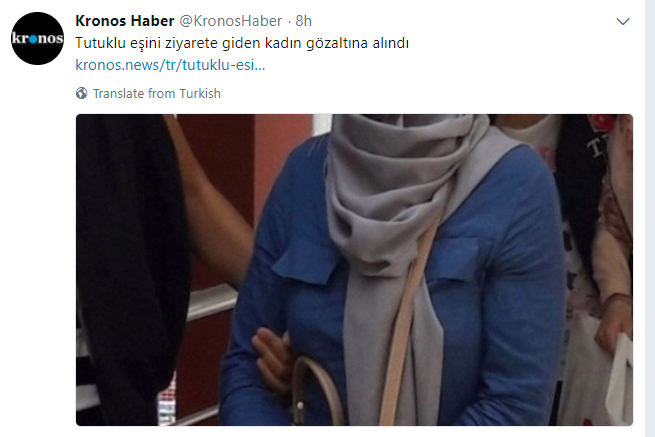 According to the Kronos news portal, the woman went to the Osmaniye prison in order to visit her husband M.K., who has been held in pretrial detention since early August 2016. When he entered the prison, he was detained by the security guards as part of an investigation launched by the Konya 2nd High Criminal Court. The woman was detained on alleged membership to the Gülen group. In a currently ongoing government crackdown on alleged and real members of the Gülen group, dozen of women have been detained while visiting their imprisoned husbands in the past months, with their children either separated from them and given to family members or taken to jail with the mothers. Turkey survived a military coup attempt on July 15 that killed over 240 people and wounded more than a thousand others. Immediately after the putsch, the Justice and Development Party (AKP) government along with President Recep Tayyip Erdoğan pinned the blame on the Gülen movement, inspired by US-based Turkish Islamic scholar Fethullah Gülen. The movement denies the accusations.